"The funniest jokes are the real life stories." is only for propaganda! The jokes below this line are mostly mine; seriously! I worked one day as a waiter at a French restaurant where I met a whole lot of different people with different attitudes. Like this lady who didn't know what she wanted to eat! It was this guest lady on my table, took her fifteen minutes to look at the menu and to make her selection. She ordered: " Let me have a house salad with French dressing, an order of bread and butter… no, make that margarine. I want chicken noodle soup with lots of crackers, okay?" I said: "Okay." Let me have the lamb chop dinner with asparagus spears indtead of potatos, okay?" I said: "Yes, mam." — "And Ice cream ala mode for dissert with extra hot apple pie, bring that right away, because I'm hungry, okay?" I said: "Okay, mam." —"Ah," she said, "the salad, make that a caesar salad instead of the house salad with extra anchovy, okay?" I said, "All right, mam." — Oh, I see you have a new item here, what's that? …This one here, on line 35?" I looked at her and then looked at the menu, yes, there was a new baked salmon with fresh basil and some other stuff on it. I said: "Okay mam, you want the baked salmon instead of lamb chop?" "Yes," she said, "and some tartar sauce…" She kept talking, changing her order and driving me nuts. I wanted to tell her: "Look, woman! Why don't I treat you to a coffee, maybe you wake up and decide why you came here, okay?" Or, "Come on, mam, hurry up, I have things to do. I have to be home to watch CN before the kids take over the TV room. (that's CN and not CNN, alright?)" Or "Mam,, this ain't no 'Reza's Restaurant' in Chicago, you know. Over there, they will give you an extra order of baqlava for wasting the waiter's time; just say your thing and go, okay?" Or, "How about adding some French dressing to your soup? That will make it real French!" Or, "If you really want a French food, why don't you take your tail to McDonald's and get a big order of French Fries?" Or, "Let me tell you woman, I'm not here for what you'd call 'for my health', okay? The only reason I work here is that they will give us a lollypop at the end of our shift. Now, tell me what you want and let me do my job." Instead, I was nice to her and made it short and sweet, I said: "Say what?!" Anyway, before my shift was over, they told me that I was fired. They said I was talking to myself and I had scared the big boss's wife. And the lollypop, I didn't get it, I didn't make to 5 P.M. In 1930's, Uncle Joe had just arrived in America and found a job as a cook in a restaurant in Southside Chicago. He was a good worker and soon he learned the language. A friend told him: "Hey man, with the talent you have, you can make whole lot more in downtown." So, Uncle Joe went downtown looking for a better job, but the people seemed had a hard time understanding him. They kept telling him: "Man, speak English…" But he knew that he had learned the language and he was speaking it fluently. Someone paid a close attention and told our Joey to repeat what he had just said, and they found out that the language he was speaking, wasn't English, it was Polish ! In 1981 when I just had arrived in Chicago, I got my first paycheck and I treated my friend to lunch at McDonald's. He ordered a coffee with a dessert, and I ordered a Big Mac meal. I opened my bag, looked for a fork to eat the fries with, but there was no fork. Instead, there was a stick, and I assumed that was the fork, you know, a single-prong fork. I said to myself: "Hmm, so this is how the Americans eat their food, with a stick! Okay!" I had some fries using the "fork", I laid it down and continued with the BigMac. My friend quietly took the "mono-prong fork", wiped it clean and stirred his coffee with it! We both laughed inside and said nothing. It was 4 in the morning and I was doing my early jogging exercise. I came across some bushes, and I heard someone counting: "Fourteen, fourteen, fourteen…"
My curiosity kicked in. I turned around to see where the noise was coming from. I was looking around when suddenly, from inside the bushes a short man stood up… BAM! With his two fingers poked me in my eyes; and continued: "Fifteen, fifteen, fifteen…" I was blinded for a few minutes. "Ouch!" I said, "What in the world was that! Why did you hit me?" The shorty said,"Just counting the nosy people in the 'hood." If you've been to Chicago, you must have seen Chicago Botanic Garden. In summer, it is the most peaceful and romantic place in the Midwest. This is where I met my two geese friends! In June 1997, I was having a good time walking through the Chicago Botanic Garden when I thought to myself it would be a waste if I didn't make this day a special one; I just had to create something memorable. Walking towards the pond, I saw some Canadian geese and slowly I walked towards them. They were all talking to each other, you know, quack-quack, quack-quack, and so forth. At first they all sounded alike, just some birds making noise. But with a little attention, I realized each one had a different tone and I would say a different attitude. 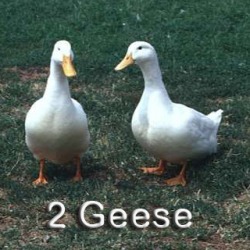 There were two particular white geese that grabbed my attention. The male was doing most of the talking, and the female was kind of agreeing with him with her gestures. How did I know which one was the male, from him being so loud! I mean QUACK-QUACK, QUACK-QUACK… He was big and dominant! I tore off a piece of bread and came closer to feed them. They were interesting. While they were picking the pieces of bread, they would look at me and continue speaking--quacking. My curiosity was raised. I scooped down, feeling I could understand what they were saying. I listended more closely, and I had in fact started comprehending them. "…That's right", the big one said, "I told you, I've been watching these people. Hmm… they are getting paid to feed us, and if we complain about them, or show any dissatisfaction, they will be fired on the spot, you will not see them again." "Wow!" the female said, "and how do their bosses know that we are complaining about them? How do they get fired?" —"Try it, okay? Whenever anyone gives you a dried out bread, or something that doesn't agree with your appetite, just bite his finger, just like that. Bite him and show him who's in charge. You will not see him again. He will be fired immediately and won't be allowed to be around us anymore." These two were just blabbering (quacking). I was shocked how they thought about us. I mean, you walk in a park, see some birds, you feed them, right? But they think you are obligated to do it, how dare they! How unappreciative! Anyway, I didn't know wether to laugh or grab their beak and wack them. By me staring at them, I had grabbed the male's attention. He came closer to me and looked at my face and said: "Look at this one, what do you looking at? You ain't got no more food left, why are you still here? Get out of here, shoot! (QUACK)"
I was mad. I was gonna say something, but he kept talking…"look at his nose! Where did you get it enlarged? (QUACK-QUACK)." Now, I was angry. I had fed these suckers, thinking they were so cute and fluffy, not knowing they were being sarcastic to me. I tried to catch the male and give him a piece of my mind, but he was fast, with a flash of an eye, he flapped his wings and jumped on me and bit my nose! I'm just glad there was no one there to see this. I still have a mark on my nose 'til this day. So I decided I had had enough of watching birds for the day. I left the pond in a state of confusion. I was happy that I had learned a new language, but confused and hurt, emotionally and physically; I had stitches (bandaid) on my nose and I had found out that some geese just like some people think that we are obligated to feed them! If you happen to visit the Chicago Botanic Garden, and see the geese, trust me, stay away from the big one! Click here "Contact us" to send me your comments, about 2 Geese or about less serious facts of life! I hate it when some individuals who can never be happy. The other day, I met this person, I said "Let us travel all over the world". She said: "No (! ), let's go somewhere else ! I was roaming in Athens, Greece, and I met this girl I thought she would make a good daughter-in-law for my mother. I started talking to her, and told her how nice of a guy I was and needed someone like her to be my woman. I told her that I was very lonely and she would be a good candid to share my love seat with me. I talked to her for a long time and she looked at me and just shook her head and smiled. All of a sudden, she waved her hand and left. Later on, I found out the Greeks doen't speak Assyrian! Years ago an Englishman was exploring Australia when he saw this animal with long legs and short arms, and carrying the baby in her pouch. He asked the native man what the name of the animal was. The man shook his shoulders, like he was saying in body language: "That's obvious..." Kangaroo ! Years later, after the Englishman had published his encyclopedia, he learned that "Kangaroo" in that part of Australia meant: "I don't know!" us a long time ago ! When I drove trucks, once I heard a phrase that sounded interesting to me. I was anxious to find out if I were pronouncing it right. Who would I try it on? On my wife, Belinda, of course. From her reaction I would know if my pronunciation were correct. Bingo! I had pronounced it perfectly.